The beginnings of the new main stage, dj, and dance areas sit quietly above Guitar Gorge. Please click on the image to view the full-sized photo. Seba Sideways' performance last evening was charming, hot, and very very cool all at once. He covered Miles Davis, Rico Rodriguez, Elmore James, and Jeff Golub among many others, before wrapping up his performance with Marvin Gaye's classic Sexual Healing. 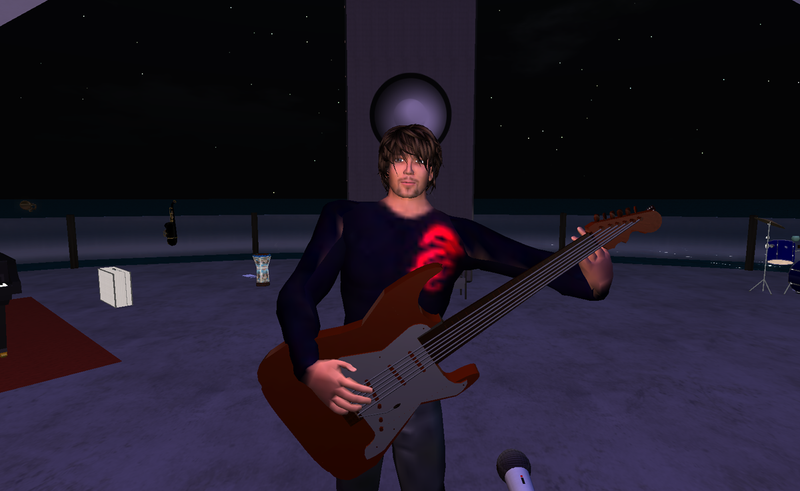 Totally engaged with the audience, Seba thanked Openlife for hosting him and looks forward to coming back regularly. Thanks to everyone for making his grid debut a warm success! See you in a few weeks for our Massive May Makeover Party! Please click on the photos for full-sized images. Enjoy! 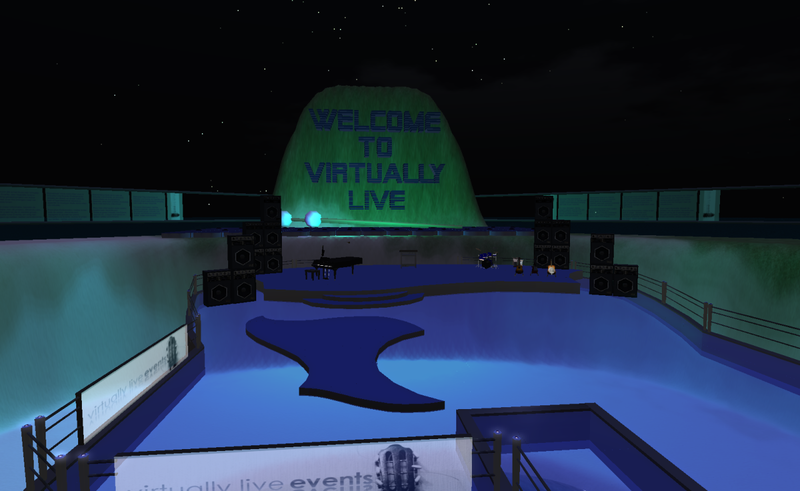 Yes, the rumors about Virtually Live closing are true. We genuinely regret it had to come to this. 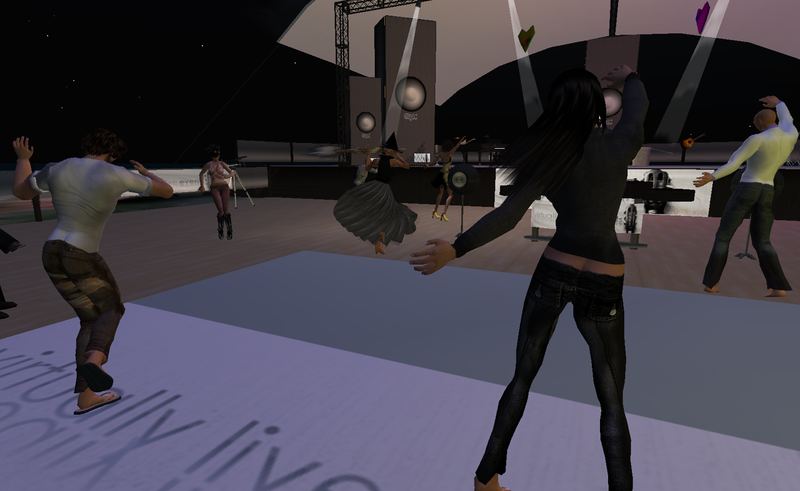 We've had some great times from the Openlife Grid Christmas Party, through the Muy Caliente Beach Party last weekend, and, finally, closing with Seba Sideways this coming Saturday. 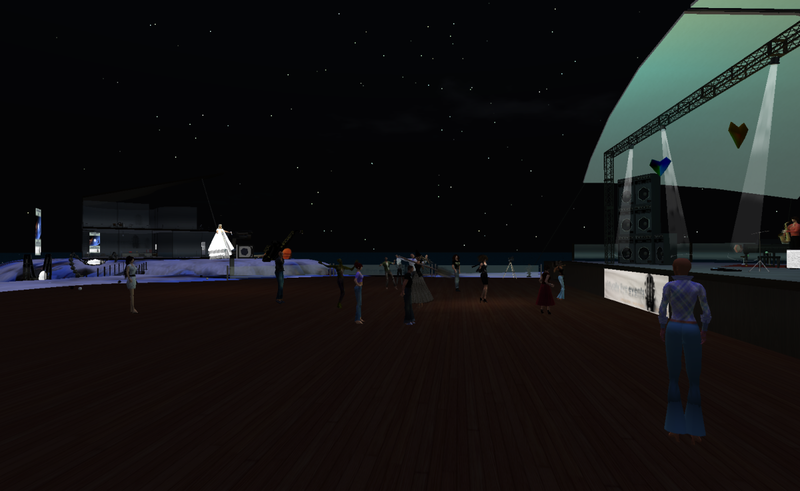 So, please come celebrate with us and take a look at Virtually Live one last time. Sunday morning I will be logging in and wiping the region clean. And Monday morning I will be starting our MASSIVE MAY MAKEOVER!!!!!!!!!!!!! Yes, yes, yes! We have been listening to all our guests and performers and Virtually Live will be getting a top-down, east-west, north-south makeover of massive proportions. 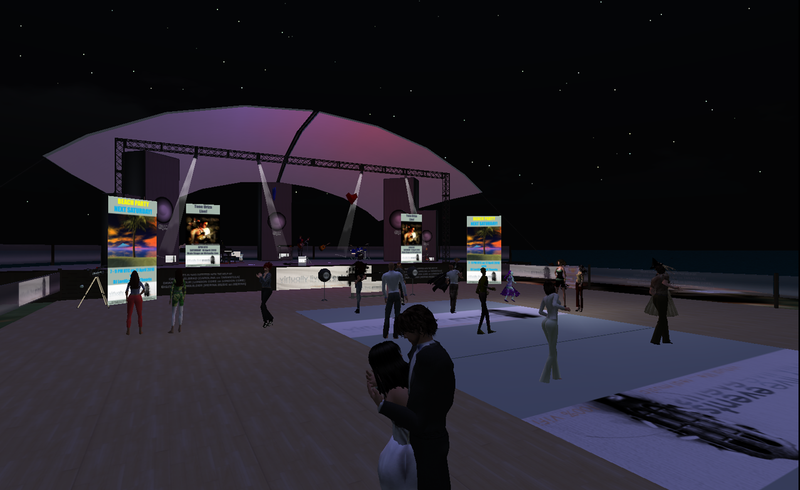 The current build has set a standard for music venue design in virtual worlds and will be missed. 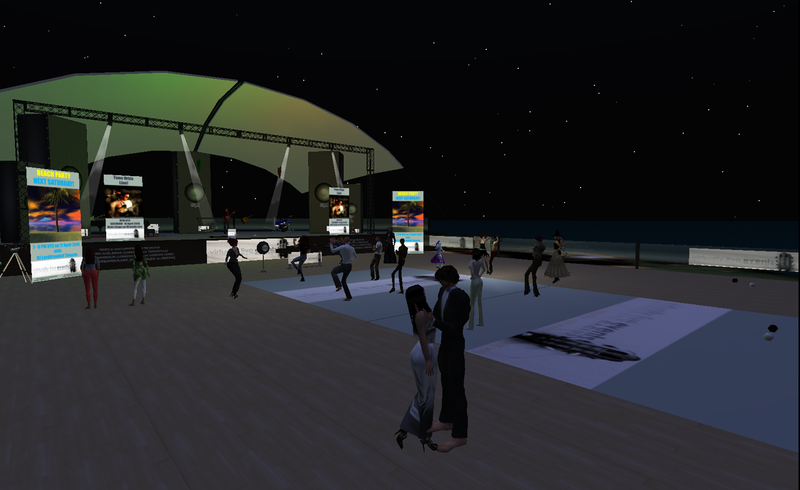 The new design retains thematic elements of the old but refreshes the builds and the terraform to give Virtually Live Events the flexibility required in the months ahead to respond to audience and performer requests. 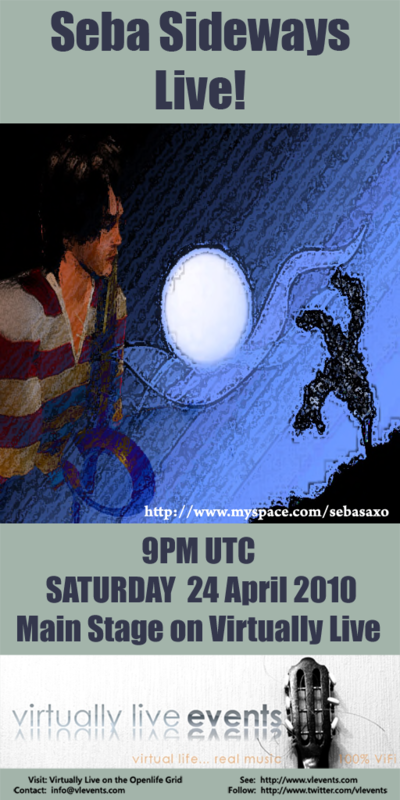 I hope to have the majority of the work concluded in time for a Massive May Makeover party on 15 May 2010. Thank you so much, once again, for all the support. 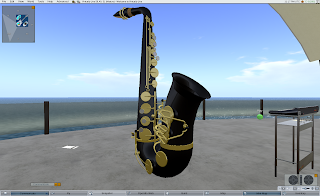 This will also be the debut of our saxophone on Virtually Live now that it's been animated thanks to Digital Dreambuilder (available at Merina Music). 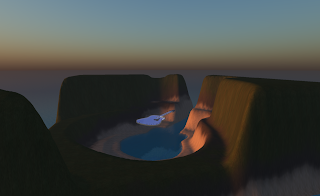 I have been told there are several in SL who have seen it (a copy is on display there), and jaws dropped, so we are especially happy to have Seba coming to visit to make it sing! I regret the late hour for our European guests. The recent time shifts around the world make it difficult to schedule events effectively this time of year. 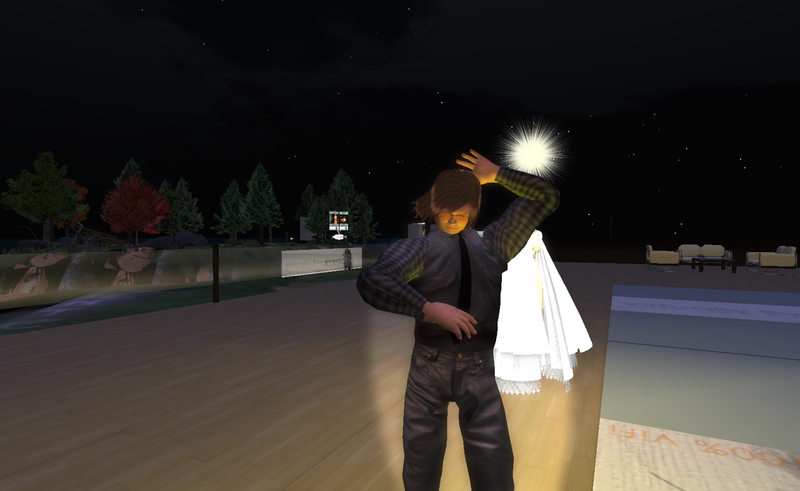 Taunter who is in Belgium and Anek who is in Arizona remarked specifically about the impact on their fees and audience numbers in SL. But please try to come if possible and enjoy some really fine music. 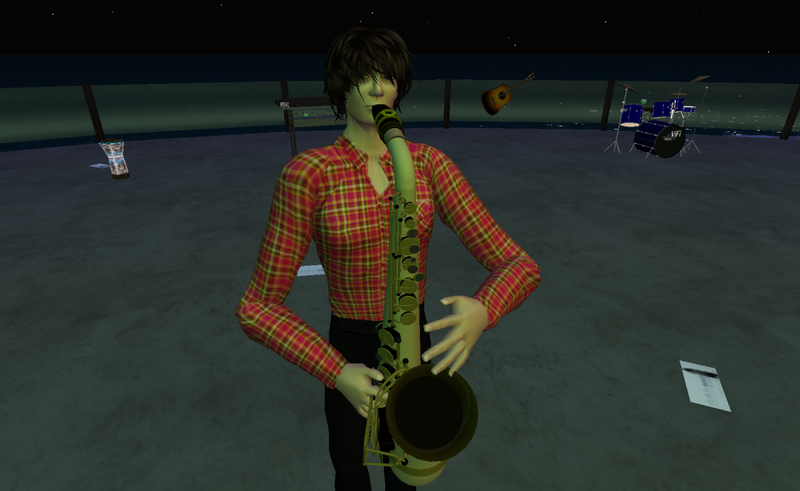 Thanks to Yohana Carter for the great music and to everyone for coming! 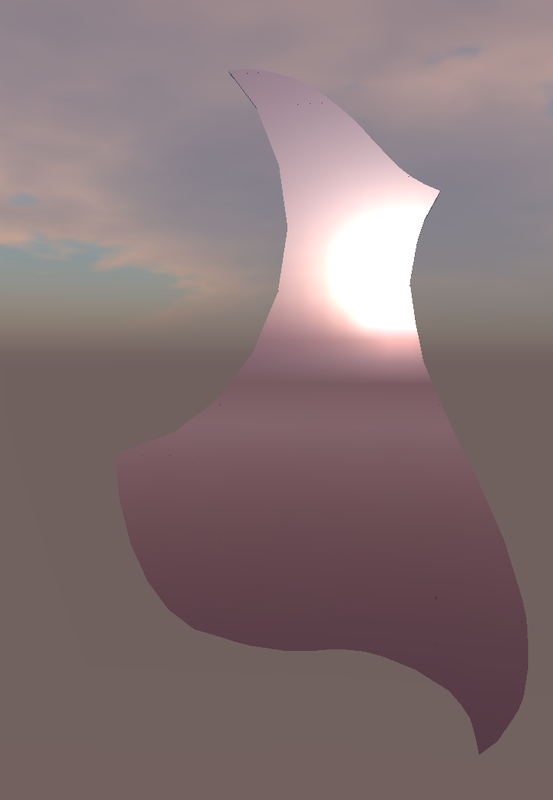 And yes yes yes, there will be more beach (and other parties) on Virtually Live! Pants (Pantaiputih Korobase) worked his magic again and posted this vid on http://openlifechat.ning.com It is being reposted here for your convenience. Enjoy! 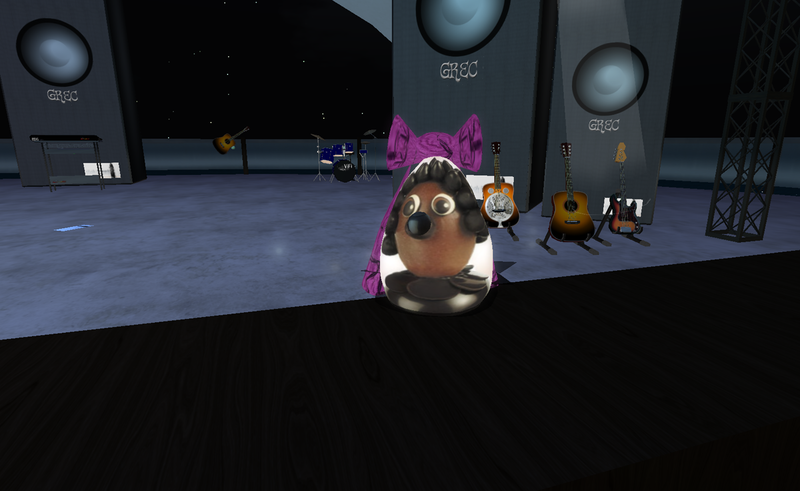 It was another fine performance and crowd on Virtually Live last evening as Tone Uriza took us from blues classics like Etta James to moderns like Keb' Mo' to his own original material using voice, guitar, and dobro. 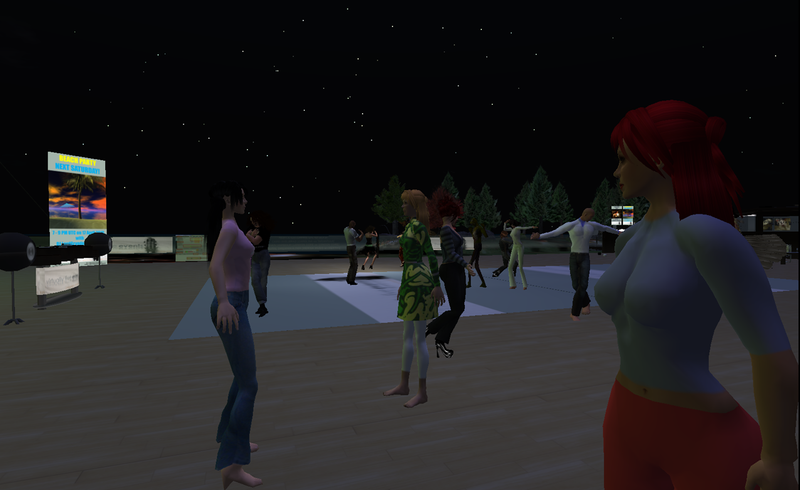 The crowd included some visitors from SL who thoroughly enjoyed the performance as well as meeting others from Openlife grid. Thanks again to all for coming! Please click the photos to see the full-sized images. Enjoy! 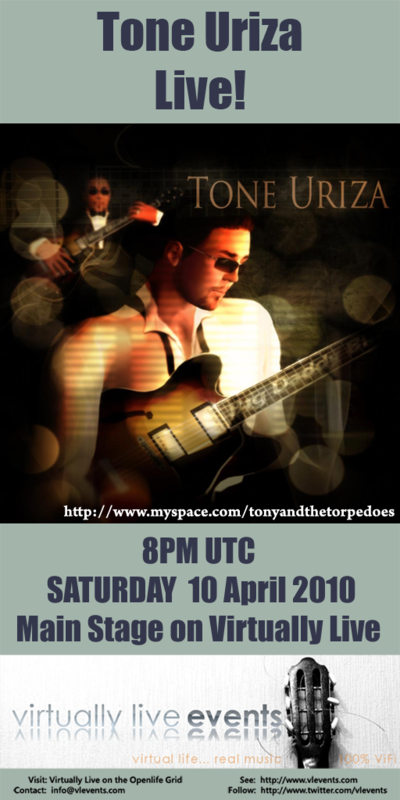 Tone Uriza, http://www.tonystorpedoes.com/index.html, will be playing (guitar and dobro) and singing blues live this coming Saturday, 10 April 2010 at 8:00PMUTC on Virtually Live's Main Stage. 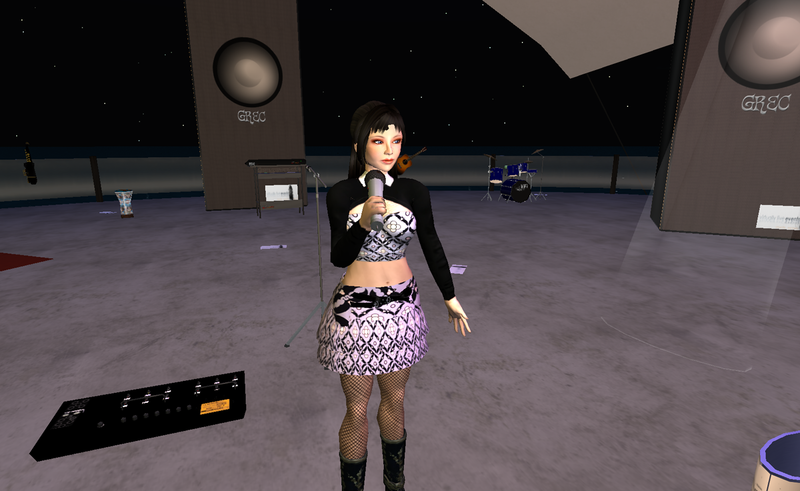 Again this week, the performer was impressed by our grid. Taunter specifically cited: the large crowd size; the helpful and skilled people in Openlife; our generosity (I didn't see the final count but I think she received nearly C10000 in tips! ); and our appreciation for music. 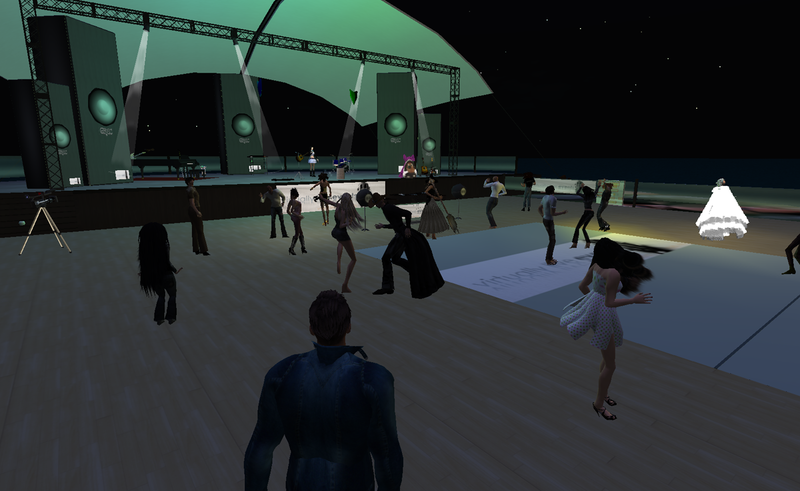 Thanks to everyone for coming to celebrate Taunter's debut on Openlife with such enthusiasm and love! P.S. Please click on the images to view full sized photos.